The world is continuously changing and people are beginning to embrace green energy more. One of the types of green energy is solar lighting and as you might know, there are different types of solar lights. 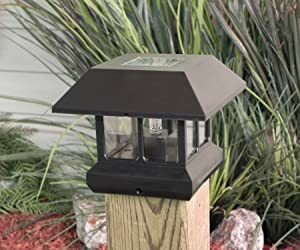 In this article, we will be focusing on solar post lights and we will do our best to review some of the best solar post lights you can find. We will also give you some tips that might be useful for you before buying one and after buying. What To Consider When Buying A Solar Post Light? How To Install Solar Post Lights? 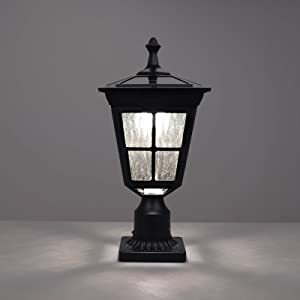 Finding the best solar post lights can be a daunting task because there are lots of them available for sale. 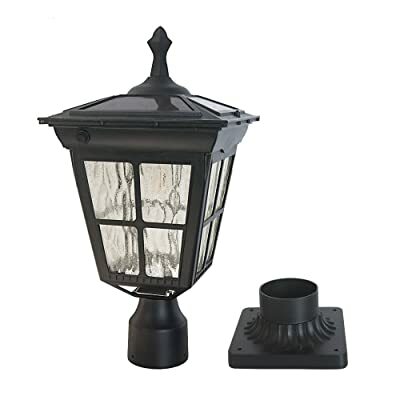 Whilst the uses of solar post lights are almost the same, their features and style vary. But do not panic because we will be giving you some information that will help you ease the process of selecting the best solar post light. The size of solar post light is important because of the preference of the users. When bigger solar post lights are chosen, they are easily detectable and sometimes make the surrounding look crowded. But when solar post lights are smaller, they can easily be eased into the decoration of the surrounding. Apart from the full size of the solar light, the size of the base is also to be considered. This is because the base size is what will determine whether or not you will be able to install the light on your post. The scope of the light is how far the light will reach when it is turned on. Before choosing any solar post light, ensure that the light can at least cover its immediate surroundings. Although, it is better if it can light up a larger area. Furthermore, if you are going to be installing the post lights on the rails of staircases, ensure that the scope of light is enough for you to see your steps. To have an idea on the scope of the light, look out for the lumen of the light because most times, this determines how bright the light is. One important feature you should consider before choosing your solar post light is the material used in building it. There are different materials manufacturers use for building solar posts but the most common ones are plastic and steel. Lights with a plastic body are not as strong as their steel counterpart but they are lighter and easier to carry. We would advise that you choose solar lights with steel build because they tend to last longer. There are two types of sensors you can find in solar lights and they are; motion and light sensors. Motion sensors work by turning on the light when it detects movement. This is good for security purposes because you get to see intruders before they get close. Also, the light sensors work by automatically turning on the light when it is becoming dark and off when it senses light. This helps to ease the stress of users turning on/off the light manually. When solar lights are waterproof, it means they have the ability to keep out water. Choosing solar post lights that are waterproof ensures that your lights last for a long time. Also, solar lights with weatherproof feature ensure that they withstand any harsh weather condition. This allows you to use the light all year long without worrying about it being damaged by heat, dust or snow. Considering the average time needed before the solar light will be fully charged is important. Often times than not, the manufacturers usually put the information on the pack of the solar light but if you can, you can ask someone that has used it before to confirm. 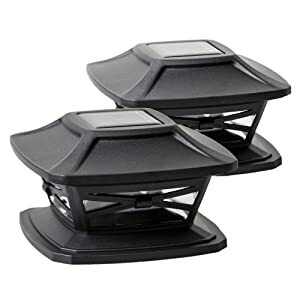 As you know, there are lots of solar post lights that you could possibly purchase. 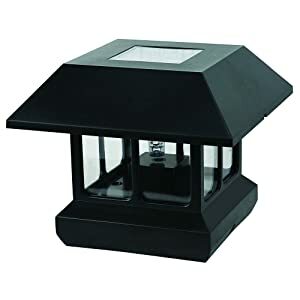 We have decided to pick some of the best solar post lights we could find and reviewed them for you. The Kemeco Cast Aluminum Solar Post Light is one solar light that caught our attention because of its brightness. It has 6 high powered LED lights that provide 50 lumens output in total. Also, the solar light has 4 powerful solar panels that allow it to efficiently collect the sun's energy for charging. Besides, it has a replaceable battery with the latest kemeco technology that allows the battery to reach its top capacity in no time. Another interesting feature of this solar post light is its auto on/off feature which turns on the light at dusk and off when it is dawn. Furthermore, the solar post light isn’t only about performance because it can also be used as decoration too. 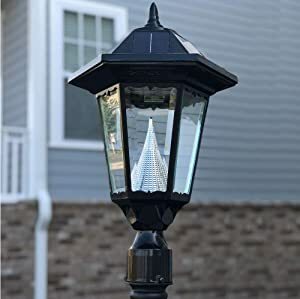 The Kemeco solar post light is beautifully made with ripple glass and classic design which makes it a good decorative fixture for your surroundings. Assembling of this post light is also not a daunting task and this is due to the fact that it requires no wiring. All you need to do is to place the product on its mounting base which is included in the pack. Finally, because durability is important, the manufacturers have made the post light weatherproof. With this, you can rest assured that no weather condition will limit the performance of the solar light. This is another beautifully designed solar post light. Each of the lights includes 10 LED lights with an output of 80 lumens. The lights have dual colour features which enable the users to choose between bright white lights and warm lights. Besides, these light colours can be changed with just a switch which makes the process seamless. Another interesting feature of the Gama Sonic GS-106FPW solar light is its auto on/off light sensor. This sensor lets it automatically turn on the light when the sun is setting and off when it is dawn. Furthermore, for durability purpose, the solar light has a powder coated aluminium body that doesn't rust out like other metals. Also, to protect the solar panel, the manufacturers had it covered with tempered glass which in turn makes it last longer. Installation is also easy and you do not require the expertise of electricians. This is because it has no wires, making it possible to install it in minutes. 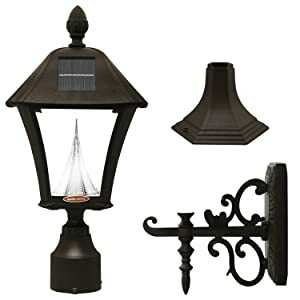 In addition, the solar light has 3 mounting options which further give you versatility in installing. 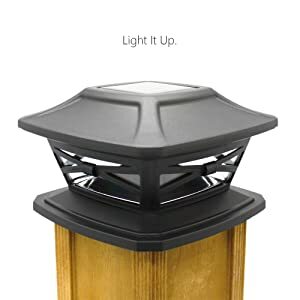 Finally, the solar light has a built-in cone reflector technology that helps disperse the light hereby increasing its illumination. The Davinci Solar Post light is a one solar post light that will interest potential users. It has a fascinating look which makes it aesthetically pleasing. Also, it has a bright light with each LED light having a total output of 15 lumens. The LED lights are warm white which further makes it attractive. When exposed to direct sunlight or when the solar panels are fully charged, you can rest assured that the lights will run for up to 8 hours. Besides, the solar light runs on 3.2v 300mAh ion rechargeable battery which is known to last for a long time. Furthermore, the manufacturers put great attention into the quality of the product. This is because the solar light is made out of industrial grade plastic with UV fade protection. This means that apart from the plastic being strong; the solar light will still retain its colour no matter how long it is used. Also, the solar panels are protected with tempered glass whilst the whole solar light feature has an IP44 weatherproof feature. This allows the user to be able to use it anytime regardless of how terrible the weather is. The lights also turn on automatically when it is becoming dark. Moreover, with the LED life span of 100,000 hours, you can rest assured that it will serve you for a long time. Finally, installation of the solar light is very easy and all the screws needed for installation come together with the product. It has UV fade protection. The Gama Sonic Gs-99F is a solar post light with 12 extremely bright LEDs with a total output of 150 lumens. For ease of use, the light has 3 modes which are; high, low and off. When the light is left on high illumination, it can last up to 10 hours before the battery runs out. Also, when the light is lowly illuminated, it can run for up to 15 hours. Besides, this long-lasting light is made possible by the solar light's internal lithium-ion battery pack. Furthermore, the Gama Sonic Gs-99F has an auto on and off sensor. This allows the light to be turned on automatically when it is dusk and on when the sun starts to rise. Also, if you have no intention of using the light, you have the option of turning it off totally till you need it. Lastly, the solar light is easy to install and this is because of the absence of wires which makes things complicated. Installation takes a few minutes and all that's required is for you to place the appliance in a place with good sunshine. 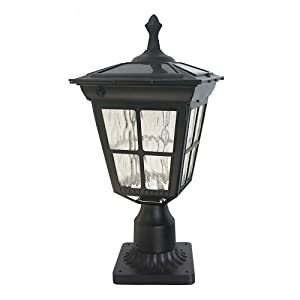 When looking for solar post lights that combine efficiency with beauty easily, then the Classy Caps SL075W 5x5 Majestic Solar Post light is for you. It has 4 high output surface mount LED that allows it to shine brighter than most LEDs available. Also, it has 2 powerful Ni-MH AA rechargeable batteries that allow it to stay lit for over 10 hours. In addition, this solar post light has an auto light sensor that lights it up automatically when it is getting dark. 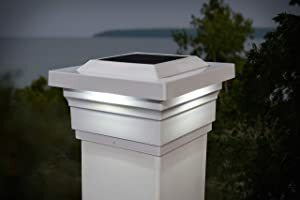 Furthermore, the solar post light has an elegant white finish and look that gives your surroundings an aesthetic value. Durability was also taken into consideration by the manufacturers and its durable white vinyl perfectly reflects this. This helps prevent the solar light from fading, cracking or turning yellow due to dirt. Finally, the solar light is easy to install and all you need to do is to place it on a 5”x5” post. As at the time we reviewed this product, we couldn’t find any bad feature. The Moonrays Stained Glass Solar Post Cap Lights are beautifully made lights. The light has a stained glass plastic lens that gives the light an adorable look when turned on or not. The light has a warm white glow and an output of 18 lumens with a wide beam angle of 120 degrees. Besides, the light is powered by a rechargeable 1000 mAh Ni-Cd battery that gets to charge fast. However, ensure that the solar panels are placed where they can have direct contact with sunlight to enjoy them. 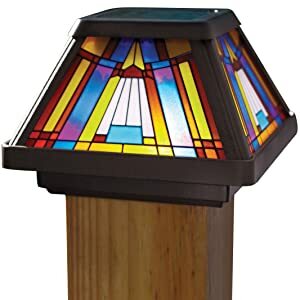 Furthermore, the Moonrays Stained Glass Solar post Cap light is durable and this is because of its strong plastic frame. The frame is also brushed with a beautiful copper finish which ensures that the solar light withstands any weather condition. Also, the copper finish gives it an aesthetic look that makes it a perfect appliance to beautify the environment. Moreover, this also makes it a good choice for patios, porches, decks, etc. In addition, the solar lights have auto on/off sensors which automatically turn on the lights at dusk and off at dawn. Also, installation of the solar light is easy because it has an installation post, screws and an optional mounting bracket in the box. This allows you to place it on the ground or mount it on the wall depending on your preference. This is another product from Moonrays and we assure you that it is also a good one. 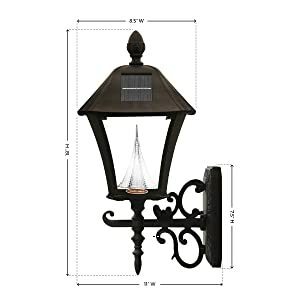 The moonrays 91262 Montclair-Style Solar post cap light isn't the brightest solar post light but it has amazing features which we will talk about later. It has an output of 2.4 lumens and this is powered by one AA600 mAh Ni-Cd rechargeable battery. It also has an enhanced solar panel that makes the battery charge in no time. Besides, the battery can last for more than 8 hours provided it is fully charged. 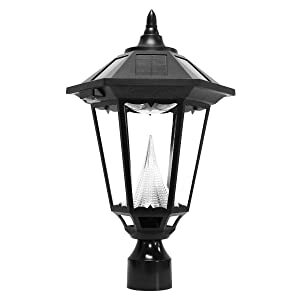 Furthermore, the design of this solar post light is exquisitely done to suit your porch, driveway and patio. Also, the moonrays 91262 is very durable and this is reflected by its strong plastic fixture and its waterproof design. The waterproof feature ensures that you can install the solar light outside in any weather condition. Finally, installation is also hassle-free and this is because it comes with 4 mounting stakes and screws. 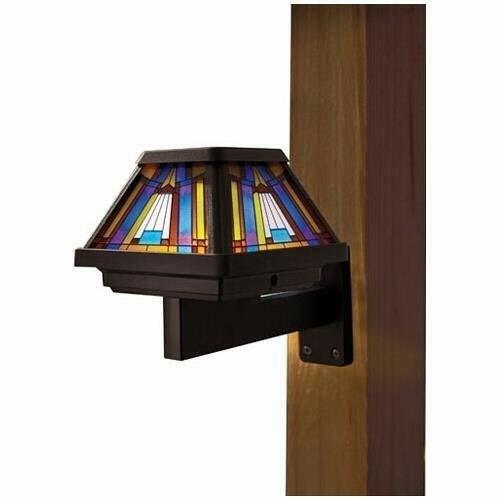 The Sterno Home GL23124 Paradise light can be used as a post light or can be installed as a path light. Installation of the product is very simple and by using the 4x4 mounting posts, you get perfect solar path light. This product is well suited for your yards, paths, driveways and porches. 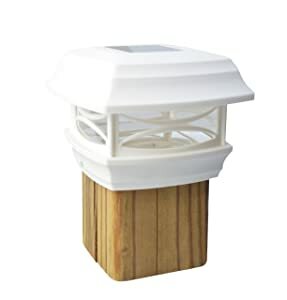 Furthermore, the solar light has an auto on/off feature that allows the light to be turned on when it senses darkness and off when the sun starts to rise. This allows for the convenience of use and the conservation of power. Talking about its solar panel, the manufacturers ensured that the solar light has an advanced crystalline solar panel. This solar panel ensures that solar energy is collected easily for conversion to electricity. Also, this solar light is made from strong plastic that ensures that they stand the test of time. Its weatherproof feature also allows you to use the solar light all year round regardless of the weather condition. Finally, to attest for the product's durability, the manufacturers have placed a one year warranty on it, giving you a reasonable assurance on your purchase. Solar post lights are easy to install but some people do not know how to. This is why we will be writing about the easy steps involved below. To get the best of any solar light, ensure that it is placed in areas where it can get contact with direct sunlight. This allows it to get charged on time hereby making you enjoy the light more. Lamp posts vary in lengths and the depth of the hole depends on the length of the posts you purchased. Although, on average, you only need to dig the hole for about 2 to 3 meters. You should, however, ensure that you do not dig the holes with the posts to avoid breaking them. This is the last step and all you have to do is place the solar lights on the post. However, ensure that the lights fit tightly to prevent them from falling off. Sometimes your solar light will fail to turn on, not because it has gone bad but because of some minor issues. In the subsequent paragraphs, we will be giving you tips that can get them running again. Solar lights with light sensors will stay off during the day because it is converting light for use at night. When you realize that your solar light isn’t coming on regardless of the time, then you should try to cover the solar panel completely. This is because there might be another source of light that is powering the solar panel making it unable to turn on. When the solar panel is covered completely, it is tricked to believe it is night time hereby triggering it to turn on. Solar lights sometimes have rechargeable batteries that are charged during the day to be used at night. Over time, the batteries tend to lose their capacity and you can notice this when the light run time become decreased. When you notice that your light has refused to turn on, it might be because the battery is totally bad. So, before you dispose of the solar light, ensure you change the battery first. 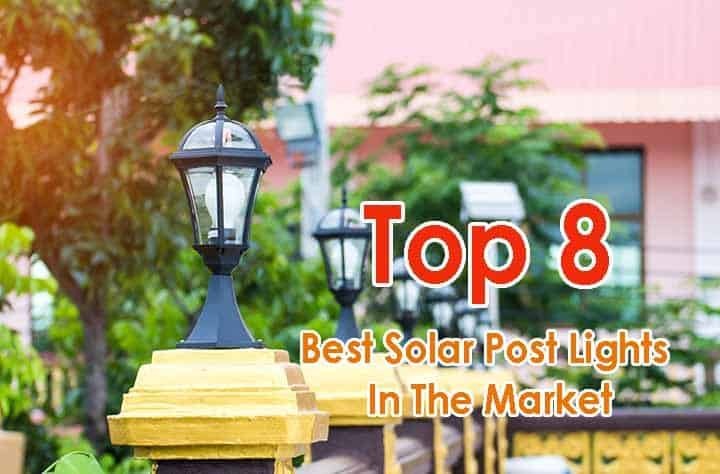 We have come to the conclusion of this article and importantly, we reviewed some of the best solar post lights available for sale. After the review, we have reached a conclusion that the Kemeco Cast Aluminum Solar Post Light trumps every solar post light in our list. 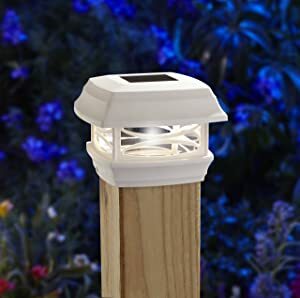 This conclusion was influenced by the solar light’s bright light, its durability, its beautiful finish and battery pack which isn’t common with solar post lights. We also wrote about factors to consider to help you buy the best solar post light. In addition, we also gave some useful tips we feel you will need if your solar light fails to turn. In conclusion, ensure you take our tips and advises seriously because we are sure that it will help you make a better purchase decision. This light has 6 high powered LED lights that provide 50 lumens output in total. Also, the solar light has 4 powerful solar panels that allow it to efficiently collect the sun’s energy for charging. Besides, it has a replaceable battery with the latest kemeco technology that allows the battery to reach its top capacity in no time.